The most successful coach in African Nations Cup history says the modern game is being undermined by players whose primary motive is money. 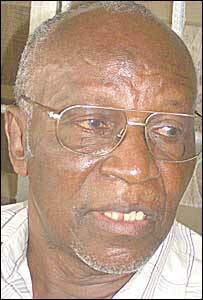 Charles Kumi Gyamfi is revered in Ghana for engineering three of the country's four Nations Cup titles - in 1963, 1965 and 1982. But as Ghana prepare to go in search of their fifth African title, the Black Stars legend has told BBC Sport that the current generation of players is driven by money not national pride. Gyamfi said "something has to be done about the mentality of the players" before the Black Stars can even think of winning a record-equalling fifth African title in their own backyard. "The players that I worked with played for the love of the game and were totally committed to playing for their country," said the man known in football circles by his initials, CK. He added: "Today's players don't know the value of the national jersey but my players were prepared to die for their country." "Obviously, not all football players are motivated by money but there are many who only think about money instead of the jersey they're wearing and what it means." There's no one team that impresses me - even my own team, Ghana, does not impress me as such. Asked about Ghana's chances of winning this year's Nations Cup and equalling Egypt's record of five African Nations Cup titles, Gyamfi said the hosts face a daunting task. "I have never in my life predicted that my team is going to win but I always told my team to respect their opponents. "There's no one team that impresses me - even my own team, Ghana, does not impress me as such. "I have a question about the team so I cannot say that they are going to win. There are so many teams in Africa that are very dangerous. "Those who feel that Ghana is going to win are not coaches. "These are people who expect the team to win at all costs and put a lot of pressure on the coach and players. "People must stop putting pressure on the players because some players cannot contain this kind of pressure."